We know many of you are happy with a beer, a hot dog and a spot on the berm. 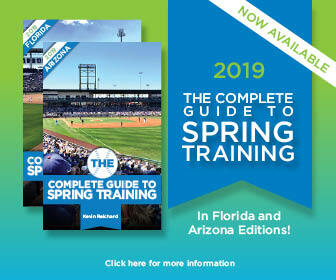 But we also know many of you are looking for more in spring training. Here are the ultimate Cactus League fan experiences on tap for 2018. Scottsdale Stadium, home of the San Francisco Giants, is the hottest ticket in the Cactus League, and the Charro Lodge is an even harder ducat to score. The popular right-field lounge features an all-you-care-to-eat buffet, patio seating, plenty of shade and a general-admission ticket to the ballpark. The Lodge holds 550 fans, but plenty of groups schedule outings to Giants games. The Lodge is sponsored by the Scottsdale Charros, whose charitable support of spring training is key to the Giants training in the city. You can call 480/990-2977 to buy tickets. At Surprise Stadium, the Budweiser Legends Deck is a ticketed tent in right center field, complete with an all-inclusive catered meal, a dedicated bar with drink voucher, and plenty of TV for following March Madness. The price is $30 with ballpark admission, $15 upcharge if you’re already in the ballpark. Surprise Stadium, of course, is spring home of the Kansas City Royals and Texas Rangers. The Eighteen|76 Deck at Camelback Ranch-Glendale, spring home of the Chicago White Sox and Los Angeles Dodgers is reserved for groups during the week and available to the general public for Weekend Premier games. For $62, you’ll have access to a shaded area on the second deck and an all-inclusive menu with ballpark foods and soft drinks, with optional drink service available. Several upgrades are available at Peoria Stadium, spring home of the San Diego Padres and Seattle Mariners. If you’re tired of ballpark food, you can upgrade to the Chef’s a la Carte offering on the Club Level, with shaded dining and lounge seating, a semi-private bar and restrooms, and gourmet ballpark dining, all for $25 per person. In the All You Can Eat area on The Terrace, you can do exactly what the name implies for $25 per person. It’s located on the third-base concourse behind the Upper Box section. In both areas, the offerings change daily and are tied to the day of the week: Sundays, for example, feature brunch-style dishes.